If you’re a local business, meaning most your business comes from customers in your community, you must get very serious about your local SEO playbook. Look, if you’re a local business, meaning most or all of your business comes from customers living in your community, you must get very serious about your local SEO playbook. Don’t worry, ranking locally for the kinds of things your prospects are looking for isn’t rocket science, but it does take a serious commitment to a handful of things. In case you’re wondering if it’s worth the investment in such a commitment, let me share a few survey tidbits. 98% of searchers choose a business that is on page 1 of the results they get. And, I could go on, but I’m guessing you see the point – if you don’t rank well locally for the things people are searching for marketing will be a lot harder and a lot more expensive. 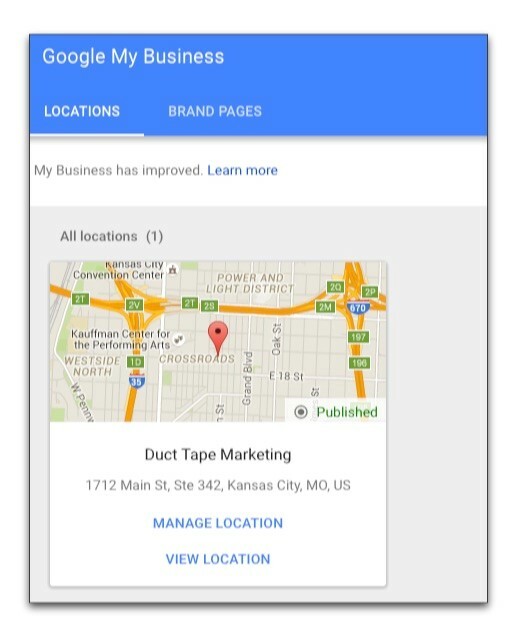 Google has a bit of a naming crisis when it comes to their local directory listings, but for now, you must pay attention to, claim, and optimize your Google My Business Listing. If this is news to you go immediately to Google’s Free Business Listing page and find out if you can claim your current listing. Many people created or had created Google+ listings and Google made a mess of how this became Google My Business so you may have some cleanup to do to make sure that you only have one listing for your business and it’s the one Google thinks is your business. Once you claim the right listing you need to make sure you take full advantage of all of the real estate and linking options available to you. This, by the way, is essential if your business is to ever show up in the coveted Google 3-pack for local searches shown above. Make sure you have the right business category and subcategories chosen for your business. Search engines are busy trying to adopt a consistent markup protocol to help use HTML code to properly identify things like businesses, reviews, addresses, books, movies and the like. You can learn about the current popular markup for local businesses by visiting Schema.org. Using proper markup for your address is kind of like handing Google your business card on a silver platter. It doesn’t look like anything to the naked eye, but Google spiders can be 100% certain what they are looking at when it comes to identifying an address on your web pages. The good news is that you don’t really need to know anything about the underlying code to get this part right. Simply visit Schema.org’s Local Business NAP generator and fill in the blanks – The tool will produce the HTML code you need to add to your site in place of your current address. There are other things you can do with structured markup and you can read all about it here. So, you might very well be familiar with a few directories like Yelp! and Google Local, or maybe even an industry specific directory or two like Houze or Angie’s List, but you probably didn’t realize that Google relies on hundreds of data aggregators and directories to help them sort out and keep straight all of the local businesses out. So, getting your listing straight on Google is essential, but if you’ve moved, or changed your phone, or just listed your details in all sorts of ways in business filings or Chamber directories, there’s a good chance Google isn’t sure which listing is correct and that’s not a good thing. Google use many data sources to try to get the most accurate picture. 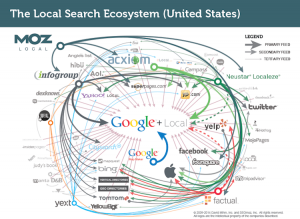 The image above from MOZLocal shows the interrelation of information sourced between data aggregators, directories, and search engines in the US. The last thing Google wants to do is send someone to the wrong address when they search for a local business. This is an example of a local business that has multiple inconsistent citations online. The name is spelled out differently, there are three different phone numbers and at least two different addresses. I’m certainly not picking on this business – In my experience, some sort of inaccurate data is out there for most businesses. Use a tool like MozLocal and see just how bad this problem is for your business. 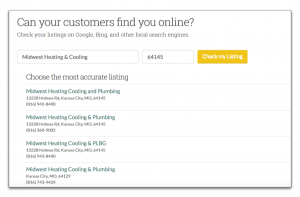 Once you determine there are a few inaccurate, inconsistent and incomplete listings use MozLocal, BrightLocal, WhiteSpark or Yext to clean listings and suppress inaccurate duplicates that often occur. You might also want to check out this list of other local directories by city and this list of industry specific directories. This step alone can do more for your local listings than any other aspect of local SEO. This one should be obvious but it kind of isn’t. If you think about it, when you create a brochure and hand it to a prospect that pretty much know that you work in their city. But, when you create content online, you need to go over and above to spell out where you do your work. Now, it’s easy to get spammy listing lots of local content and that can hurt you as much as help you, but you certainly should talk about where you work and in some cases have specific pages with case studies for specific trade areas, suburbs, and neighborhoods. Don’t forget to blog and post about local events and happenings. Using your blog to take about community, customer, and employee related local news is a great way to spice up your local content in very authentic ways. If you have multiple locations you may want to learn about and adopt what many SEO folks refer to as content silos for each location – here’s a great primer on local content silos. Reviews have become another important form of content. As the statistic cited at the beginning of this post suggests, people increasingly rely on reviews to make decisions about the products and services they purchase. So, while you need positive reviews for social proof, you also need them as a pillar of your local SEO efforts. Google factors review activity as one of the elements that helps determine what businesses show up in the 3-pack. No, it’s not the only factor, but it’s an important one. 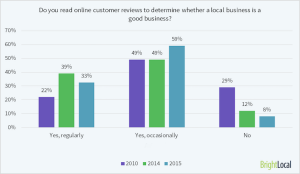 This graph from a BrightLocal survey demonstrates just how important reviews have become in the purchase journey for local businesses. Just a few years go nearly 30% admitted they didn’t use reviews – today that number is 8%. Meaning – 92% of buyers regularly or occasionally rely on reviews when making a local buying decision. Take a look at the businesses in the image above. Reviews are displayed and play a large role in what businesses are shown and for the consumer, what business are clicked. You must have at least 5 reviews for Google to display the review stars as a highlighting feature of local results – that alone makes it important to acquire reviews. Reviews are harder to get than they should be. Even a business with raving fans must work to get those reviews from happy customers. You can always repurpose these reviews in email newsletters, on your site, or even hanging up in the store. Many businesses are finding that they need to make review collection a process rather than leaving it to chance. Tools like GetFiveStars and Grade.us can help automate the process of review collection. Take some time and make each of the five steps above a priority for your local business and you may find that local leads drawn from organic search can become your most potent lead generation channel. SEO Link Building – What Not to Do!